Grön makes every square of their melt-in-your-mouth chocolate using hand harvested, fair trade cocoa beans. 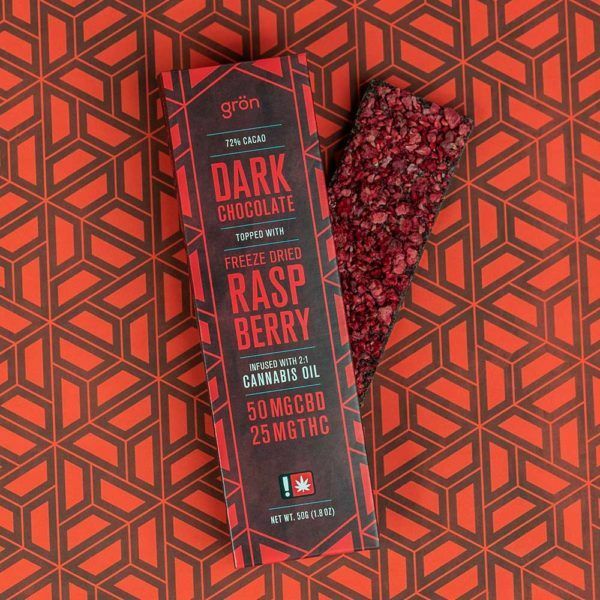 This particular bar has a layer of locally harvested freeze dried raspberries to add a burst of tart fruit to completely contrast the dark sweet, bitter chocolate. Accompanying the delicious flavor comes a healthy dose of CBD to provide relief and a small amount of THC to improve the effectiveness of the CBD as well as creating a small buzz to help keep your mind afloat.